McGee outlined her 2017 focuses during the GPCC Public Affairs Committee meeting on March 10. Arizona State Sen. Kate Brophy McGee speaks to the Greater Phoenix Chamber of Commerce Public Affairs Committee March 10, 2017. After serving three terms in the Arizona House of Representatives, Republican Sen. Kate Brophy McGee is working hard during her first term in the Arizona Senate where she continues to advocate for education issues and represent her north Phoenix-based Legislative District 28. 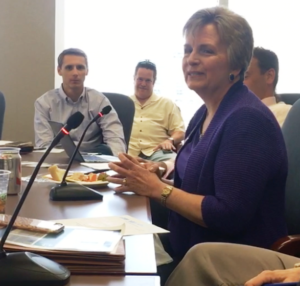 McGee, a third generation Arizonan, outlined her 2017 focuses during the Greater Phoenix Chamber of Commerce Public Affairs Committee meeting on March 10. After serving 10 years on the Washington Elementary School Board and six years on the Arizona School Facilities Board, much of McGee’s attention is dedicated to improving Arizona education. To keep herself up-to-date on the most current Arizona education issues, she requested to serve on the Arizona Senate Education Committee. “I thought it imperative given the issues that are facing our K-12 and higher education arenas that I reengage,” McGee said. McGee highlighted funding as the most serious issue facing schools. “To quote Superintendent Diane Douglas, ‘we are at a crossroads in K12 education,’ we are at a crossroads in education funding and we need to address those issues seriously,” McGee said. McGee is also an advocate for child welfare, and this year she is involved with several bills aimed at improving the Department of Child Safety (DCS). She believes the state is making steady progress toward improving services in this arena. As a member of the Senate Transportation and Technology Committee, McGee also discussed the issues facing Arizona’s infrastructure, specifically challenges in upkeep of existing transportation routes and finding funding for new highways. Like most lawmakers in Arizona and across the United States, McGee seeks to continuously increase her understanding of the state budget, funding priorities and how much money is available. “Every year I work hard to do a deeper dive in the budget to understand what it is and what it does because when it hits I am in a better place to effectively negotiate,” McGee said.